Named after one of the great Persian Emperors of ancient times, there can be little doubt that Frances Simpson expected great things of 'Cambyses' when she acquired him as a kitten in 1899. 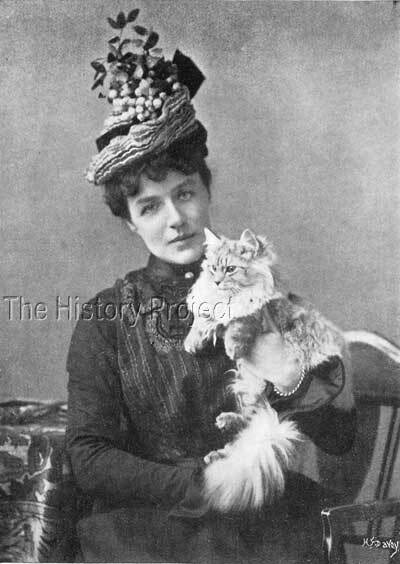 She also condescended to have her photograph taken, holding him in her arms, for the frontispiece of her first book, Our Cats and All About Them published in 1902 by Sir Isaac Pitman & Sons. 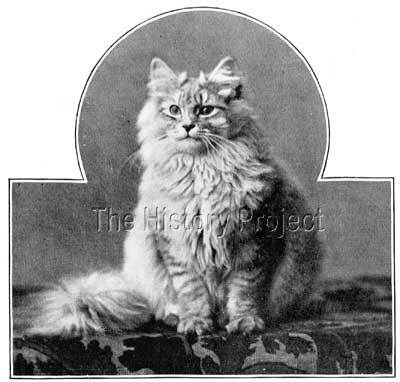 This was a full year ahead of her epic work, The Book of The Cat published in 1903 by Cassell & Co. Ltd.
Like most breeders of Blue Persians, (and Miss Simpson's loyalty and fidelity to the cause of the 'Blue' could certainly never be questioned), she too, dabbled in Silvers, as these were a popular variety both within and outside the fancy. But the circle of top lines was very hard to break into and as a judge she had her detractors and some political opposition. Nevertheless, in 'Cambyses', she had successfully acquired control of a grandson of the very famous 'Ch. Silver Lambkin'. Although he was probably a perfectly acceptable example of the breed, he does not appear to have been considered by the more serious breeders of Chinchillas as a top show prospect. But Miss Simpson was able to demonstrate her mastery of diplomacy and marketing, by getting the best possible value from this nominally good male and standing him very successfully at Stud for a number of years. She tactfully promoted his good points, glossing over his shortcomings and significantly raised his public profile. By modern standards this achievement would be akin to the role of a 'campaign manager'. In short, he was in good and experienced hands! 'Cambyses' was bred by Miss Chappell, born on 17th April 1899. 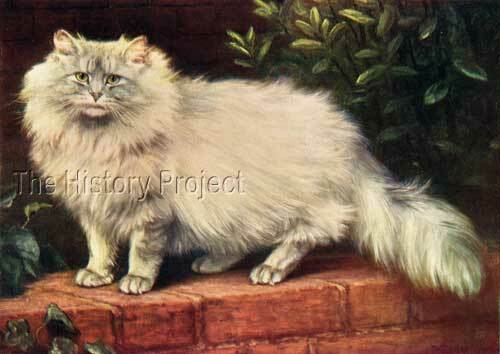 His sire was 'Mowgli' (1897) a first line chinchilla son of the famous 'Ch. Silver Lambkin'. His dam was an unknown female named 'Victoria', whose colour and background is shrouded in mystery. In some databases she is listed as a Blue, in others as a Silver Grey, but Frances Simpson states categorically that she was a Silver Tabby. "A rumour has reached me that I intend to sell Cambyses. This is perfectly untrue. It is a grief to me that I cannot keep the dear fellow with me in London, but I know how carefully he is looked after by Mrs Taylor, whose devotion to him equals my own. In next week's issue of Our Cats I shall be advertising him at stud at Mrs Taylor's new address, which will be within five minutes of Ashford (Middlesex) Station, where very up-to-date catteries are in course of erection. I hope to exhibit my stud cats at Southampton, (not for competition, as I am judging). " "On being shown into a most inviting dining-room to await Miss Frances Simpson, I saw, spread out on the hearth, in full length, in front of a bright fire, one of the loveliest 'silvers' I had ever seen. 'I suppose this is Cambyses?' I asked of Miss F. Simpson, after exchanging greetings. 'Yes,' she replied, 'he is the pet of the household,' which remark did not surprise me, for a more amiable-looking cat it would be impossible to imagine. He is a lovely shade of pale silver, and only very slightly marked. His head and face are beautiful, and he certainly does his sire Mogli [sic] more than credit.
" 'I am very surprised you have not exhibited him,' I remarked. 'I have never had the heart to send him to a Show,' Miss Simpson replied. 'I have entered him on two occasions, but, when the time came, I felt I could not part with him.' 'Well,' I said, "I hope I shall see him at Westminster?...' 'I shall enter him!' she replied, whereupon we both laughed heartily. "It was a pretty sight to see Cammy's mistress toss up a ball of paper, for each time Cammy would stand on his hind legs and gracefully catch the ball with his two front paws! " He also states of Cambyses: "Cambyses weighs between 10 and 11 lbs, a record weight, I should imagine for a silver!" "'Do you have any photographs to let me have?' I asked, and Miss Simpson gave me one of herself and Cambyses, and another of a pair of blue kittens, bred by herself. After making me feel quite at home, and as if I had known her for years, Miss Frances Simpson informed me that her mother expected me to stay for lunch. I needed no second bidding, for I was in no hurry to leave to this pleasant home and kind, hospitable friends. "In course of conversation, I asked Mrs Simpson if she, too, were fond of cats. 'I don't profess to love them,' she replied, but I noticed that though she was not so entirely devoted to the feline species as her daughter, yet she had no small amount of sympathy with them, and a lurking love for 'Cambyses'." 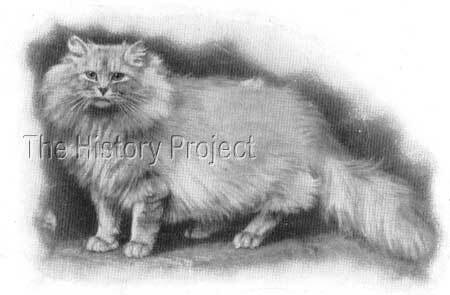 The register of The Cat Club, records one full sibling, named 'Tamina' born of the same parentage on the same date, a chinchilla female, subsequently sold by Miss Chappell to Mrs. C. Reay Greene. 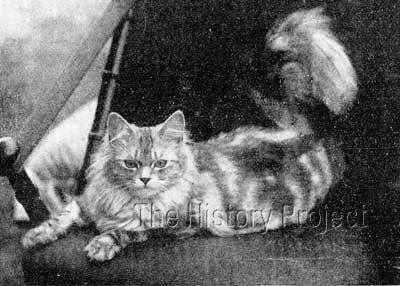 One such silver tabby daughter, was Miss Lederboer's 'Lady Grissel' for whom we do have a photo, as it appeared on the front cover of 'Our Cats' published 1st August, 1903, when 'Lady Grissel' was but just one year old. 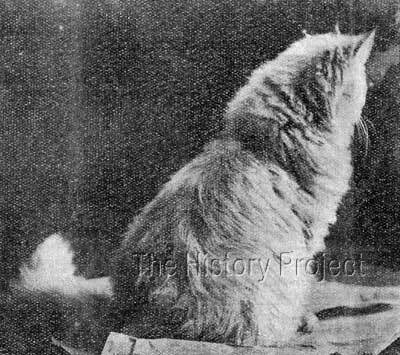 "The beautiful kitten illustrated on the front page is an eight months old son of Cambyses. Persia's Prince is going out to Mrs. Brian Brown, of Brooklyn, New York. He was bred by Miss Wood from her Zillah, a daughter of Abdul Hamet. His body is quite umarked, and his head and paws only very slightly barred. At six months old he weighed 7-1/2 lbs." 'Persia's Prince' was exported to Mrs. Brian Brown, of Brooklyn, New York. It is clear that both of the following pieces of social media artwork, were derived from the photographic study above, from Frances Simpson's book. The first image, is a full size painting taken from The Wonder Book of Animals by Harry Golding. The image is unsigned and undated, but in style at least, it is very similar to the painting s by W. Luker Jnr that appeared in Frances Simpson's The Book of The Cat(1903), published by Cassell & Co.Ltd. 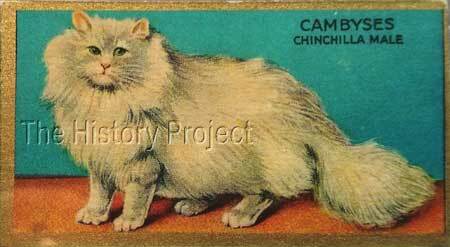 The second image is a collectible card from the 'Cowan's Noted Cats Series' produced in 1925. Unlike some of the others in this series, the cats name is listed correctly and a good attempt has been made to colour it to look like a green-eyed Chinchilla! 'Mowgli', the sire of 'Cambyses' was a half-brother to 'Lord Southampton' and 'Lord Argent', two of the more well-known sons of Mrs Balding's immortal silver, 'Ch. Silver Lambkin'. 'Cambyses' was, in his turn, the most famous son of 'Mowgli', and it was through him, that 'Mowgli' continued to benefit the ongoing development of the Chinchilla. Frances Simpson's faith in 'Cambyses' was not unfounded. He sired a great many very clear-coated silvers, and helped to expand the gene pool for silver breeders. He was well-grown and like his sire, a heavier boned silver than many of his contemporaries; the variety already suffering the effects of line-breeding and in-breeding. When we read about 'Cambyses' we are reminded that breeding is not exclusively about either colour or type; it's equally about health, vigour, and a contented lifestyle. We can be sure that 'Cambyses' was a healthy cat, who received plenty of love and attention. This certainly accounts for his even and pleasing temperament and his reliability as a sire of bonny, healthy bloodstock.